Nicole & I much looking forward to take part in this! Black Mountain College USA (1933 – 1957) comes to the Black Mountains of Powys, Wales. A full weekend exploration and celebration of the work, philosophy and ongoing influence of that remarkable, mid-twentieth century educational and multi-genre artistic experimental venture. Anni Albers and Josef Albers. Gertrude Stein, Black Mountain and Ray Johnson. Echoes and Edges: Re-reading Creeley. Thread – Paint – Ink – Film: Women Artists at Black Mountain. Olson and the influence of projective verse, particularly in reference to women’s writing. Construction and Assemblage in the Work of Robert Rauschenberg and Franz Kline. Basil King: Mirage. A film directed by Nicole Peyrafitte, co-directed by Miles Joris-Peyrafitte, starring Basil King. Mike Rumaker: ‘shifting it into the real’. John Cage, Williams Mix: collage and synthesis. Encounters with the work of Ed Dorn. The legacy of interactions between art forms at Black Mountain College and after. ‘Breath between the Black Mountains’. Charles Olson & David Jones. Abstract art & writing, leaping off from the work of Cy Twombly. On Balance: a Poetics of Memory, Labour, Practice. Hilda Morley – the longest serving poet at Black Mountain. Open multi-genre collaborative jam session with Lyndon Davies, Graham Hartill, Nicole Peyrafitte, Pierre Joris, Rhys Trimble, Camilla Nelson, Scott Thurston, Wanda O’Connor, Penny Hallasand others. Peter Hughes is a poet and the founding editor of Oystercatcher Press. He’s based in Cambridge where he was recently the Judith E. Wilson Visiting Fellow in Poetry. His books include a Selected Poems (Shearsman 2013), versions of Petrarch’s sonnets (Quite Frankly, Reality Street Editions 2015), Cavalcanty(Carcanet 2017) and via Leopardi 21 (Equipage 2018). He is currently working on a project mapping the Berlin Ringbahn. Lee Duggan is origninally from London but has lived in North Wales since the age of 20. Her writing is very much informed by location and the impact place has on identity, as well as by her experiences as a working, single mother of three. She has an MA in Writing: Practice and Context from Bangor University and her first poetry collection, Reference Points, was published in 2017 by Aquifer Books. Wanda O’Connor is a poet and doctoral candidate in Critical and Creative Writing at Cardiff University. Recent work is available or forthcoming in The World Speaking Back: to Denise Riley (Boiler House Press 2018), Wretched Strangers (Boiler House Press 2018), Bad Kid Catullus (Sidekick Books 2017), Poetry Wales, and others. She is organizer of the 2018 symposium ‘Projectivisms’ and co-runs the Cardiff Poetry Experiment reading series. 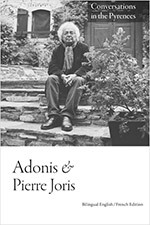 Born in 1946 in Strasbourg, France, raised in Luxembourg, Pierre Joris has moved between the US, Europe & North Africa for 50 years, publishing close to 50 books of poetry, essays, anthologies, plays and translations. In 1992 he returned to New York, first the state, where he taught poetry & poetics at SUNY-Albany until 2012, but also, since 2008, the city — happily humming Bob Dylan’s “I’m going back to New York City, I believe I’ve had enough…”. When not on the road (see the “Events Calendar” page on his blog: Nomadics or on his website: pierrejoris.com), he lives in Bay Ridge, Brooklyn — baptized Sorrentinostan by him — with his wife, painter, singer & multimedia performance artist Nicole Peyrafitte. Jeff Hilson has written four books of poetry: stretchers (Reality Street, 2006), Bird bird (Landfill, 2009), In The Assarts (Veer, 2010) and Latanoprost Variations (Boiler House Press, 2017). A fifth book, Organ Music, is due out from Crater Press in 2019. He also edited The Reality Street Book of Sonnets (Reality Street, 2008). He runs Xing the Line poetry reading series in London, and is Reader in Creative Writing at the University of Roehampton. Alice Entwistle is Professor of Textual Aesthetics and Contemporary Poetry at the University of South Wales; she is currently working on books about Gwyneth Lewis and Ciaran Carson, respectively. Her published works are A History of Twentieth Century British Women’s Poetry (Cambridge with Jane Dowson), Poetry Geography Gender: Women writing contemporary Wales (U Wales P, 2013) and In Her Own Words: Women talking poetry and Wales (Seren 2014). She was awarded her doctorate in 1997 for ‘Creeley Among Others: An American Poetics in Context’; it’s unpublished. Lyndon Davies lives in Powys. He has published four collections of poetry, the most recent of which is Bridge 116 (Aquifer 2017). Bridge 116 (Aquifer Books 2017). He is editor of an internet literature and arts magazine called Junction Box, and also runs the Glasfryn Seminars, a series of literary discussion groups. Between 2009 and 2012 he co-ran, with John Goodby, the Hay Poetry Jamboree – a festival of innovative poetries at Hay on Wye. John Goodby. Born in Birmingham, universitied in Yorkshire, taught in Ireland, living since 1994 in Wales. Lectures at Swansea University and is editor of the new Collected Poems of Dylan Thomas; has been co-editor of Irish and Welsh issues of Angel Exhaust, and published, with Shearsman, Illennium (2010). After thirty-seven years of Secondary School teaching Ian Brinton now writes full time. His publications over the past ten years have included translations of poetry from French and critical works on modern poetry. A former editor of The Use of English for The English Association he now co-edits the poetry magazines Tears in the Fence and SNOW and is on the committee setting up the Archive of Contemporary Poetry at the University of Cambridge. As a reviewer he has been published by The Times Literary Supplement, The London Magazine, PN Review, Notre Dame Review, World Literature Today, Poetry Salzburg Review and Poetry Review. Recent publications include Selected Poems & Prose of John Riley(Shearsman), Translation of poems of Philippe Jaccottet (Oystercatcher), For the Future, a festschrift for J.H. Prynne (Shearsman) and An Andrew Crozier Reader (Carcanet). Michael Kindellan is a Vice Chancellor’s Fellow at the University of Sheffield. He is the author of The Late Cantos of Ezra Pound: Composition, Revision, Publication (London: Bloomsbury, 2017); and with Joshua Kotin, “The Cantos and Pedagogy” (Modernist Cultures 2017). Peter Gillies is a poet and painter based in Falmouth. His work has been shown in Italy, France and Germany, as well as in the UK. He has received several artist’s awards from ACE and he has twice been artist-in-residence at the Scuola Internazionale di Grafica in Venice. His publications include Sintesi (with Andreas Kramer, 2003), Passaggio (2005) and A Music Box of Snakes (with Rupert Loydell, 2011). In 2016 he completed his PhD at PlymouthUniversity entitled Painterly Poetics. Most recently his writing has been published in Stride, Decals of Desire, International Times and Norwich Arts Review. Gavin Selerie was born in London, where he still lives. His books include Azimuth (1984), Roxy (1996), Le Fanu’s Ghost (2006) and Hariot Double (2016)—all long sequences with linked units. These texts often have a visual dimension and Selerie has collaborated extensively with artist-poet Alan Halsey; he has also worked with musicians in performance. Music’s Duel: New and Selected Poems 1972-2008 was published by Shearsman in 2009. Critical work includes studies of Charles Olson and Edward Dorn. Selerie’s memoir of the London poetry scene 1970-1989 appeared in Clasp, ed. Robert Hampson & Ken Edwards (2016). Carol Watts is Professor of Literature and Poetics at the University of Sussex. Her most recent poetry includes Dockfield (Equipage, 2017), and the collection When Blue Light Falls(Shearsman, 2018). She often collaborates with others in making work across forms. Ian Hunt is an art critic, curator and poet. A book of his poetry, Green Light, was published by Barque Press, his story The Daubers appeared as part of Andreas Ruth Still life paintings. He is editor of the art criticism of Stuart Morgan. Rhys Trimble is a Bilingual poet / performer based in Bethesda, North Wales originally from Pontneddfechan. An experienced performer/improvisor interested in medieval welsh language & bilingual poetry, music/poetry, collaborations, digital-art and avant garde writing practices. Recent work includes performances at Dinefwr Festival (click here to see it), Blinc Digital Arts festival, and Eisteddfod 2012 (click here to see it), Aberystwyth Drwm as a member of prosiect Datgeiniaeth – Datgan cerddi penpastwn with Twm Morys, Gareth Sion and Peter Greenhill (http://stiwdiogwellt.com/album/awdl-i-ddewi). Editor of Ctrl+Alt+Del. Ezine. He has a PhD in creative writing.